For our treats, we only use natural, fresh, and organic ingredients that we ourselves would eat. Each bag weighs 9 ounces, contains 35 to 40 treats, and sells for $8.50. Apple Puplings (apple/cinnamon): An apple a day keeps the vet away. Made with brown rice flour, rolled oats, cage-free eggs, honey, cinnamon, organic apple juice, canola oil, freshly grated apples, cinnamon. 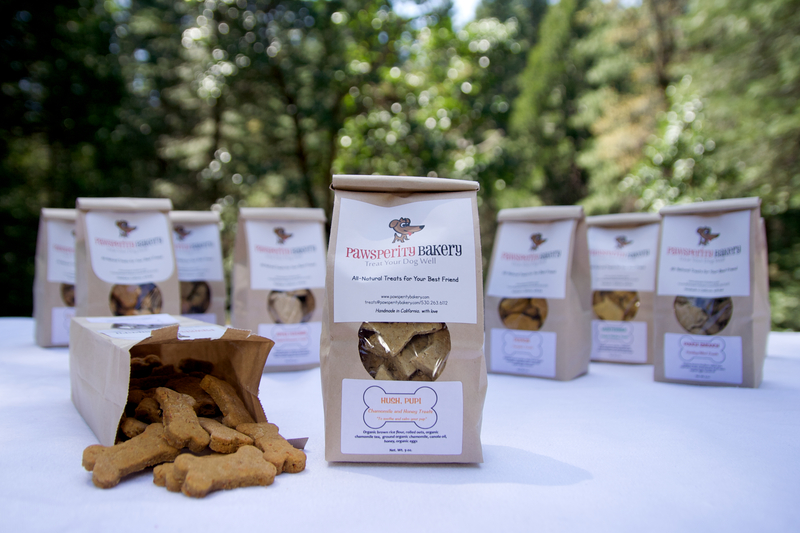 The Doggie Bag (it’s not just for mutts): Just can’t choose one flavor for your dog? Here’s a bag with an assortment of flavors to please the most discerning canine palate! Guaranteed to surprise your dog at every turn. Hush, Pup! (chamomile & honey): Use these to soothe your stressed-out pup. Made with brown rice flour, rolled oats, organic chamomile tea, ground organic chamomile, honey, cage-free eggs. Muddy Paws (carob & peanut butter): Carob is a canine-safe chocolate alternative. Made with brown rice flour, rolled oats, water, natural peanut butter, cage-free eggs, organic carob powder. Pooch Smooch (parsley & mint): Tame your dog’s dragon breath. Made with brown rice flour, rolled oats, vegetable broth, fresh parsley, fresh mint, cage-free eggs, canola oil. PupEyes (spinach & parm): Keep your dog strong to the finish. Made with brown rice flour, rolled oats, vegetable broth, fresh organic spinach, cage-free eggs, parmesan cheese, canola oil. PupKins (pumpkin): Soothing for sensitive tummies. Made with brown rice flour, rolled oats, organic pumpkin, vegetable broth, cage-free eggs, canola oil, cinnamon. See Mutt Mutter (peanut butter): Peanut butter – what dog doesn’t love it? Made with brown rice flour, rolled oats, vegetable broth, natural peanut butter, cage-free eggs, honey. Sweet Pawtato (sweet potato/molasses treats): Brown rice flour, rolled oats, fresh sweet potatoes, vegetable broth, canola oil, molasses, organic eggs, cinnamon. VegeTerriers (mixed veggie): A great choice for your vegetarian pup! Made with brown rice flour, rolled oats, pureed fresh veggies, parmesan cheese, canola oil, homemade veggie broth, and cage-free eggs.